The incidence of HIV infection in South Africa tops that of any nation in the world, with some 6 million of the country’s nearly 50 million residents infected. Sadly, young women — and particularly young pregnant women — suffer some of the highest rates of HIV infection. More than one-fourth of pregnant South African women are infected with the virus; in some communities, the infection rates are even higher. But a new study conducted by UCLA’s Mary Jane Rotheram-Borus, the director of the UCLA Global Center for Children and Families at the Semel Institute for Neuroscience and Human Behavior, and her colleagues from Stellenbosch University in South Africa found that community-based interventions could improve the health of children in those contexts. A paper about the randomized controlled trial appears in the current edition of the journal PLoS One. The study found that regular home visits of pregnant mothers, and later of those mothers and their infants, by specially trained lay community mothers from the “Mentor Mothers” program led to significantly better health outcomes 18 months later in both the mothers and their children. 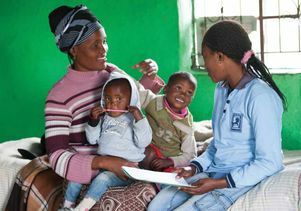 The Mentor Mother home visiting program, developed by South Africa’s Philani Maternal, Child Health and Nutrition Project, has been in existence for the past 15 years. Mentor mothers are trained to provide health information and health intervention (such as a home visit), support mothers to improve healthy births, and to help mothers develop coping mechanisms that enable them to raise healthier children. The program currently operates at eight clinic sites in Cape Town and out of Zithulele Hospital, located in a deeply rural part of the country’s Eastern Cape region. Among other outcomes, the study found that Mentor Mother home visits led to a 50 percent improvement by mothers in completing tasks designed to prevent mother-to-child transmission of the HIV virus, compared to mothers in the control group of the study who did not receive home visits, just clinic-based pre- and postnatal care. The virus-transmission prevention tasks included pregnant mothers knowing their own HIV status and asking their sexual partners to be tested; mothers taking anti-retroviral drugs for the six weeks prior to childbirth and during labor; babies receiving anti-retroviral drugs for at least six weeks, until they can be tested for the virus; and mothers using one feeding method (breastfeeding or formula) for the first 6 months of their infants’ life, and, when possible, exclusively breastfeeding. In addition, the study found that mothers who received regular home visits breastfed longer and, among HIV-infected mothers, were more likely to breastfeed exclusively for six months. “There also tended to be fewer low birth weight babies, a condition which results in life-long problems,” said Rotheram-Borus, the Bat-Yaacov Professor of Child Psychiatry and Biobehavioral Sciences and the director of the Center for HIV Identification Prevention and Treatment Services at UCLA. Furthermore, those mothers who were visited often were more likely to use condoms with sexual partners and were the least likely to have a low birth weight infant; the children from frequently visited homes were less likely to be stunted or malnourished in the first 18 months than were the children of mothers who did not receive in-home peer counseling and support. There were multiple authors on the study. Funding was provided by the National Institute of Alcohol and Alcohol Abuse and the South African Ilifa Labantwana.